Food doesn't have to be complicated and yet taste fantastic. This light, full-flavoured and mega-tasty Mexican chicken and guacamole dish is quick and easy to make. There’s a bit of chopping to do but very little cooking involved. 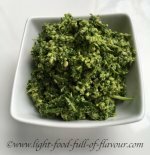 It’s a perfect dish to make when you want to eat flavoursome healthy food but haven’t got the time, or energy, to spend a lot of time cooking. I serve the Mexican chicken and guacamole with tomato salsa on a bed of rocket leaves, spinach and watercress which sits on top of toasted sourdough bread. You can skip the bread altogether if you want an even lighter meal. And vegetarians can use slices of halloumi cheese instead of chicken, using the same marinade for the cheese. 1. In a bowl, mix together the ingredients for the marinade. Cut the chicken breasts into thin slices and add these to the bowl. Mix thoroughly and leave to the side. 2. Halve, peel and de-stone the avocados. Place the avocados in a bowl and roughly mash them up with a fork. Add the lime juice, chopped red onion, chilli and coriander, season with salt and pepper and mix together. 3. For the tomato salsa, place all the ingredients in another bowl and mix together. 4. Fry the chicken slices in batches over quite a high heat until nicely browned and cooked through – I find that by using a non-stick frying pan I don’t need to add any more oil than what is in the marinade. Toast the sourdough bread and divide between four plates. Top each piece of bread with rocket leaves and if you have any, also watercress and/or baby spinach. 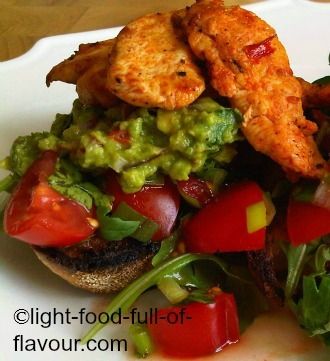 Then divide the tomato salsa, guacamole and chicken over each piece of bread.